Love this dress so cute! I think I'd wear it with a shirt underneath so I could have some collars popping out, black tights and some heeled ankle boots! Beaut dress, I would wear it with a leather jacket and boots, and a tartan scarf for some clashing patterns! Gorgeous dress! I'd wear it with a burgundy fedora and black fur coat with cute heeled Chelsea boots. Perfect for wandering around the Christmas markets with some thick tights. I would wear this dress with booties really similar to yours : Vagabonds in black with black thighs and a bomber hat <3 thank you for this lovely giveaway ! I actually love how you've styled this dress, I think mine would be pretty much the same! I'd team some black tights for the winter - I'm feeling those Primark Cosy Tights! I love cutout dresses and this one is gorgeous! It looks great on you! 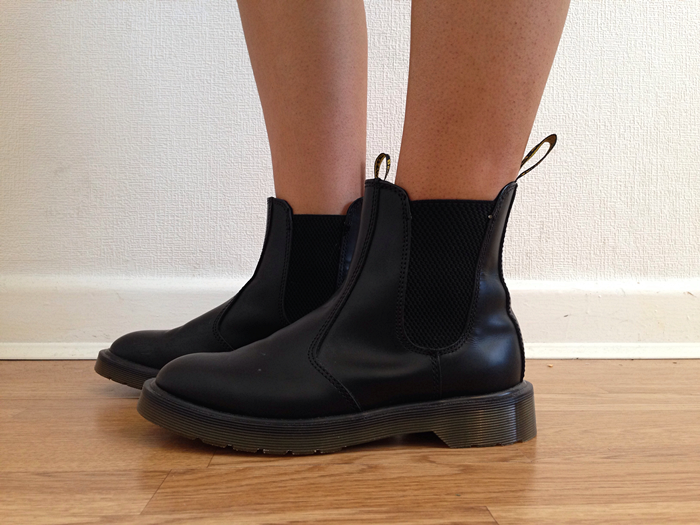 Love how you've styled your Dr Martens! With a black leather jacket, black boots, gold accessories and a pom-pom hat! I love this dress!! I would wear it with tights, and combat boots! This dress is actually so pretty, I really love the back detail! you look super lovely in this printed dress - nice and simple and perfect on a casual day! I love your style, you are so cute! I would wear patterned tights, a leather jacket and a statement necklace, with cute flats.